Kathleen’s a big fan of these shawls, in fact she just finished knitting one. 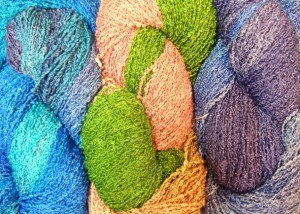 We also have some stunning new skeins of Fleece Artist Peter Rabbit. This sumptuous angora just calls out to be fondled, more than any other yarn we’ve seen. It’s like having a row of soft, fluffy clouds hanging on the wall. If you’re an angora fan, you should drop by for a look and a touch. This entry was posted on Wednesday, April 29th, 2009 at 2:24 pm	and is filed under Uncategorized. You can follow any responses to this entry through the RSS 2.0 feed. Both comments and pings are currently closed.